Can we bring back baby spicy dragon T1 and baby ichthyosaurs T1 for egg shop? 1.Can EXP Boost Event Be appears every Holiday? 2.We Hope the game add 10000 and 5000 Galder Coupon can be extracted in all maps because it is not easy to earn galder. 1. No. We may do it once in a while but not often. The rates are already high in this server. 2. You are the first to say it is hard to get galders in this server (or the first that I can remember). If you drilled ores in Tapasco mines, Gray Ash mines, or Snow mines, and sell the ores to Item Girl, you can get galders easily. We will not add those galder coupons for drilling in all maps. Is there any possibility of getting Pet slot expand? The inflation in prices for the most desired pets are really high, and I don't see a reason not to have slot expansion for pets (unless coding breaks the game, that is a valid reason). Even if they only get max 3s its still worth it in the long run. I don't have any suggestiom but I do have some questions. 1. Does that server have plans for a level up event? Like Fast Track or Road to 400. So everyone will grind for a certain time to get exclusive rewards rather than afk drilling their way to 400? 2 Does the server has plans for the use of old ms stones since it has been overshadowed by the jp ones? 3 Is there any plans for a website update since(Flash is about to die) and I think it's time for rTO to step it up in the advertising. 4 Are the whole rTO Team(GM,Aran and the Mods) reading this? If so then happy new year and thank you for keeping this game fun and alive. If it's possible, it'd be nice to have an "Item Recovery" thing sold in MyShop. The price can be whatever you think is fair. I'm asking cause a lot of people lose some items by accident, like forgetting to use patrons when expanding or selling it to npc by accident. It'd be nice if there was some way they could recover the items. Person buys "Item Recovery" in MyShop. Then, Person will contact a Mod or Aran (or whoever it is) telling them the details of how and when the item was lost. For example, lost a "Wooden Sword" by accidentally selling it to Item Girl in Paradise Shop on January 4th, 3:15pm server time. And then from that, a Mod or Aran (or whoever it is) will check if Person has "Item Recovery" and if so, proceed to recover the item for them. The process on how to recover the item can be written in the description along with the information that's needed to be able to recover the item. For example: To recover an item contact ___ and state the name of the item, time when it was lost, and how it was lost. Or any other such information that's necessary (perhaps also refine level and compounds). 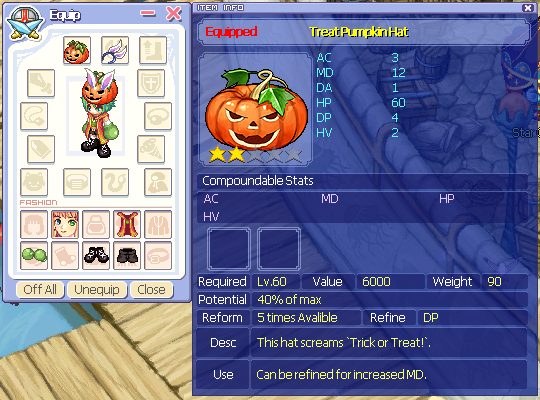 I'd like to know if is it possible to make Treat Pumpkin Hat to cover ears. Thank you! How did you get DA on your hat? The one inside the database does not have DA. The warnings are put there so that people are careful when they do things. As in real life, when we are careless, we lose things. There's only so much we can do to try to help players not to be careless in this game. The item list is done; I am not looking at any more suggestions. Please hold your suggestions for next patch note. I want to buy Heart Face Painting at the next update. I would be happy if you would grant my request. Any GM or Mod are here?